An eventful day, even if I didn't realize it at the time... In September 1998, I walked into my neighborhood stained glass store and took my very first class. Little did I know then where that little suncatcher would lead; all I knew was that I was in love with this medium. After trying many other media, I found glass, and I have been developing my skills with it ever since. Working in glass is the most rewarding experience! No matter how much you know (or think you know) there are always a whole bunch of new ideas to try, new techniques to learn, new classes to take and new artists to meet. Glass is simply an amazing material! For several years, I experimented with flat glass, learning the basics and exploring more advanced techniques. I began doing my own designs, and got so excited about the variety of glass available, choosing pieces to achieve the effects I wanted. Then, one day a friend introduced me to her Glass Eye 2000 Professional Plus, and I got addicted all over again. This awesome program opened up so many new avenues for me in flat glass, and helped me turn what had been a hobby into something of a ministry today. After several attempts to "find my niche" in the glass world, both in flat glass and kiln-formed glass, I have developed two specialties. In fused glass, I am constantly honing my skills in the use of frit to create landscapes and other images, as well as exploring the many ways to combine frit and molds, into some very exciting pieces. Everywhere I go, I keep a notebook with me, as I get new ideas wherever I am. 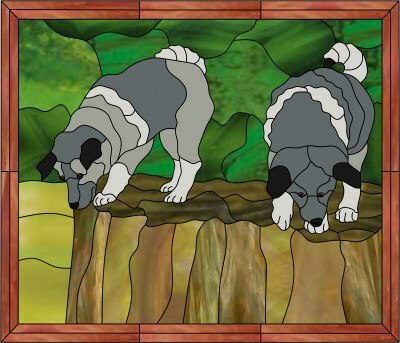 For my latest venture into the world of realistic animals for stained glass, I am now doing commission work to provide stained and fused glass trophies for dog shows. While the trophies are not the principal reason that people exhibit their dogs at shows, these trophies have been extremely well-received. You can see my passion for animals, especially dogs and cats, so let me tell you a bit about this design. This was the first day of exploration for our new Norwegian Elkhound puppies. We had put them up on a redwood stump to try to get a photo of them, and clearly, all they were interested in doing was getting down so they could continue to explore all the wonderful new smells and sights of our property. It didn't turn out to be the nice posed portrait we had planned, but it became one of our most treasured photos! Converting it to glass posed some issues, as they are all shades of grey, dark grey and black, but the result is a very accurate portrayal of their individual coloring. Robin Anderson is a retired university professor who now devotes all her attention to the creation of wonderfully lifelike panels of pets and other animals and kiln-formed art pieces in her Sunny Brook Studio. Her pets are always in attendance (read that... "under foot"!). If you wish, send her an email. She would love to hear from you!